Just like the city itself, the bar scene in Montreal is incredibly lively and full of diversity. The bars in Montreal cater to every taste, serving a huge range of fine beers, cocktails, wines, and a few other unique beverages from around the world. Here we explore the bars with the best atmosphere, drinks and live music in Montreal. Burgundy Lion is the quintissential bar for all sports lovers out there, a place where you can relax and enjoy a good hockey game. With the TV screens placed strategically around, everybody is ensured a good seat in the house. 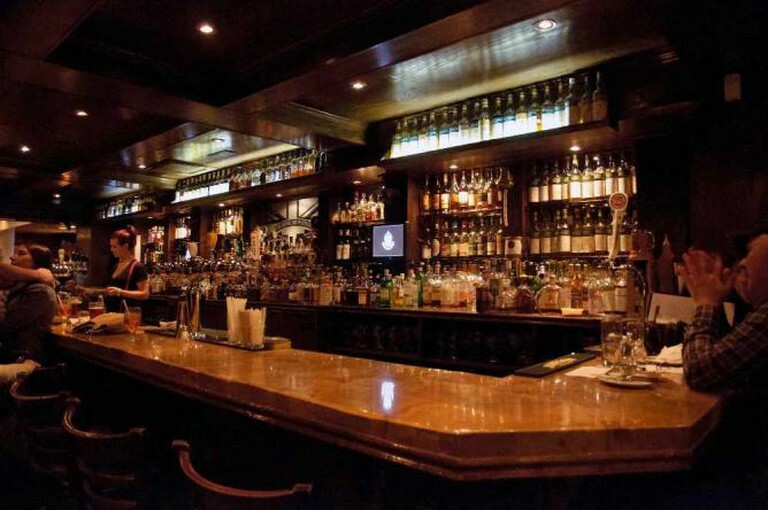 The bar has a relaxed, inclusive atmosphere with a wide range of drinks available, including the largest whiskey collection in all of Quebec with over 300 whiskeys, and excellent traditional British pub food on the menu. Everybody who visits is sure to find something to their tastes. Magnificent mixology in the heart of Montreal, Le Lab is the place to head for a spectacular and theatrical night out. The bar staff juggle bottles and ingredients, concocting whichever beverage you select from the extensive menu. There is a retro aspect to the bar along with the decadence of some of the cocktails, with a vintage cash register and quirky furniture. Every drink is served in an unforgettable way with fresh fruit, herbs and spices and the presentation is stunning. Le Lab will not disappoint. A beautiful establishment in Montreal, Dominion Square Tavern is the perfect destination for a relaxing meal and delicious drink. The bar stretches the length of the gastropub, with plenty of bar staff behind meticulously crafting the delicious custom cocktails. Excellent absinthe is also available here, quite a rare find in Montreal. The food they serve from their short but high quality menu is incredible, with the bone marrow a very popular option. Some of the most unique beers to be found in Montreal can be enjoyed here. Dieu du Ciel! draws a very diverse crowd, young and old, as well as professionals – basically anyone who really appreciates a truly great stout. The ambiance is extremely pleasant and welcoming and the craft beer is sure to impress. Their famous, original beer the Aphrodisiac comes very highly recommended with its chocolate and vanilla notes. This bar is normally very busy, which says a great deal about the quality of every beer on the menu. Guests can also grab a pint and enjoy it on the terrace. A beautiful Irish pub, with a wood panelled interior and a long bar serving all kinds of beers and stouts, McLean’s Pub is a traditional, friendly option for a weekend afternoon. Open plan, the pub has a very cosy upstairs section and an amazing terrace for summer days. McLean’s is a real hub for sports lovers whenever there is a hockey game on. The atmosphere also contributes to the excitement – there’s nothing quite like a great game and beers with friends. Everything about Chez Serge stands out, from the drinks menus made out of old Quebec licence plates to the genuine mechanical bull at the back of the bar, where many patrons challenge their friends after a few beers. The bar has a great selection of beers and cocktails, free popcorn, and even the chance to spin the wheel of fortune, with rewards ranging from a free pint to a ‘spanking’ administered by bar staff atop the bar. For guests who want to experience a creative, unique bar, Juliette et Chocolat is the place to head. Unlike most bars, there is no standard hot chocolate here. Juliette & Chocolate believe that great chocolate is like great wine, they respect the cocoa, how it was grown and harvested and, of course, where it came from. With chocolate from all around the world, every drink takes you to a different place and gives your taste buds a whole new experience. Guests are encouraged to seek out the undertones of flavour in the chocolate and consider its story, and every drink is elegantly served and beautifully brewed. In Downtown Montreal is located McKibbin’s Pub. As well as always knowing the exact number of days remaining until St. Patricks day, the pub features a wonderfully lively atmosphere. With a great range of beers and some incredible live music, Mckibbin’s brings in some of the friendliest and most open folk in Montreal. What makes this pub stand out the most is definitely the menu – specifically the Rim Reaper Challenge. McKibbin’s chef cooks up the world’s hottest chicken wings on request, so spicy you have to sign a release form first. Anybody who completes the challenge – guzzling down twelve pieces cooked with the infamous ghost pepper – wins a place on the prestigious Wall of Flame. With great staff and great musicians, this thematic blues bar in Downtown offers inspiring and passionate live music as well as a wide range of drinks and snacks. Bistro à Jojo is often crowded, but the members of the crowd are open and friendly individuals and rally to make the bar the welcoming venue that it is. The walls are decorated with old guitars and the dimly lit main room with vintage posters makes it easy to relax and listen to the heartfelt music from the live bands. An incredible venue full to the brim of Quebec spirit, guests will be amazed by the spirit and energy present in 2 Pierrots. Its open plan, with a mezzanine floor overlooking the stage where many a live band play to the receptive customers, make it the perfect place to relax. The drinks are reasonable and there is a wide range of beer and ale. There is a lively crowd every night, cheering on the many live bands that play there, whose music ranges from rock and blues to the traditional folk music of Quebec.